We often find ourselves switching our hands between our mouse or a trackpad and our keyboard. This becomes quite cumbersome to handle if you are a programmer like me or if you spend most of your time on the machine. What if I shared some secret magic mantras (a word or sound that is believed to have a special spiritual power) with you which could transform you into a Keyboard Shortcut Wizard. Yeah, you would definitely need some practice but eventually, you would become great at it. Shortcuts were made for us to save our time and do tasks quicker than using our mouse or a trackpad. Now looking at the keyboard don’t you get curious about the random letters been placed all over your keyboard? Why are letters randomly placed on the keyboard? Let me tell you that the letters weren’t placed randomly or just for fun, it had a very distinct and purposeful reason behind it. 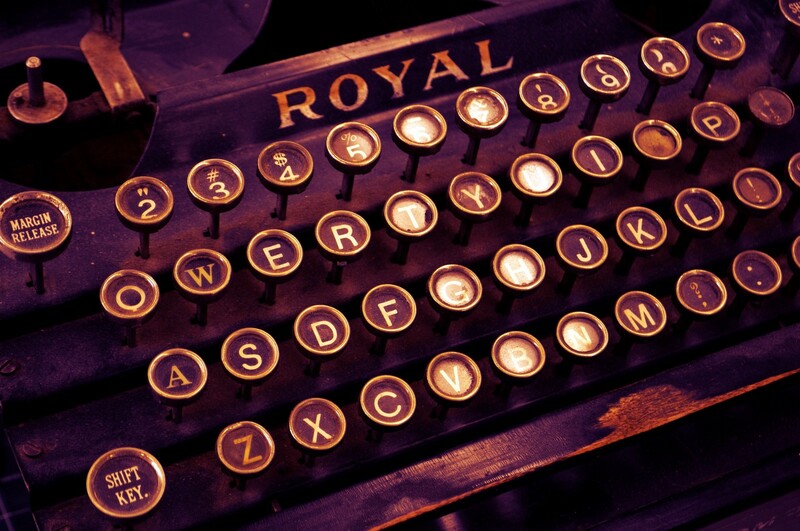 Before the 1870s, typewriters used to follow the lexicographic order on their keyboards. The problem arose when people started striking letters too fast which led the bars of the typewriters to get entangled and get jammed. To resolve this, Christopher Sholes developed a QWERTY keyboard layout in 1873. It placed keys in such a manner that the bars were less likely to collide with each other when typing. This keyboard layout then became a standard with the popularity of the Remington typewriter which was the first to use it, and all other manufacturers fell in line. Why do we still use it? You might think why are we still using the same old QWERTY layout keyboard even after 140 years which was designed to fix a problem that no longer exists? After hundreds of trials and errors, Christopher Sholes developed the QWERTY keyboard layout which was well received by the community. The QWERTY layout solved many other problems too. After observing thousands of words, Christopher Sholes formulated that to speed up the typing process, there has to be a regular alternation between the two hands. So he placed the characters in such a way that most words would make use of both hands. Now QWERTY is a widely used layout and it’s close to impossible to switch back to the old lexicographic layout as it would require us to replace all our QWERTY keyboards and we would have to learn to type on the new layout again. And as we all know people resist change which is the mere reason of QWERTY layout being stuck around until now. All the shortcuts mentioned here are focussed on Windows Operating system so sorry Mac and Linux users for leaving you off here. Although the Mac Cmd key ( ? ) is generally the same as the Windows Ctrl key and Windows Alt key could be either Mac Cmd or Mac Opt key. We won’t be discussing some of the basic shortcuts which we are already used to, like cut, copy, paste, undo and redo. I have tried to cover only those shortcuts which are lesser-known or the newest ones which will help you boost your productivity at work. 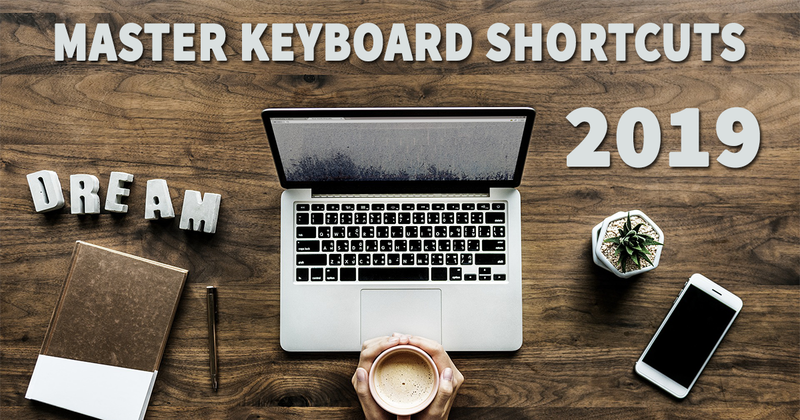 Are you ready to become a Keyboard Shortcut Wizard? If you stay until the end of this article then I have some bonus tools to boost your productivity. Note: This shortcut will only work for the versions after the Windows October update. The clipboard history saves multiple copied text and images which can be pasted in any order without recopying the texts and images over and over again. This feature caught my attention as soon as it got released in Windows October Update and since then I never had to look for any third-party software to do the task as this new feature works flawlessly. Our next shortcut is a right click fired-off from a mouse onto our keyboard with a target of shift + F10. This shortcut just right clicks on the focussed area so if you want to right click on a specific file then you first need to set the focus on that file and press shift + F10 and it will show up the options for the selected file. We often have to leave our workspace idle for some time with all our processes running in the background. It’s a dumb idea to not lock your machine while you’re away from it, so here’s a handy shortcut for you to lock your desktop using Win + L.
A program isn’t responding! No worries, Ctrl + Alt + Del comes to the rescue followed by opening the Task Manager and killing the task. But there’s a better way to do it and that is Ctrl + Shift + Esc which opens up the Task Manager directly and we can then end the selected task using the Del key. It’s always wise to know some basic information about your system, so instead of going to the properties of ‘This PC’ (formerly known as ‘My Computer’). You can simply view the system information using Win + Pause. You can take a quick screenshot of the current screen on Windows using Win + prt sc and your screenshot will be available in Pictures/Screenshots. To capture a screenshot of a desired area use Win + Shift + S and simply drag left click and drag around the area you want to copy. You can now paste that anywhere you want with the classic Ctrl + V.
We pin items on the Taskbar so that we can quickly open them up whenever required but are you still opening them up using a mouse? Well, you can open your pinned items using Win + number where a number (1–0) is the position of an item from the left on the Taskbar. Suppose if chrome is the third item from the taskbar then you’ll use Win + 3 to open up chrome. This works well for items positioned from 1 to 10 where Win + 1 is the first item and Win + 0 is the tenth item on the Taskbar. What about more items in the Taskbar? You are free to navigate through the items on the Taskbar using Win + T followed by using the arrow keys to select the desired item. If you want to toggle the system tray then use Win + B and select the desired item. You can open Windows Action Center using Win + A and toggle the notifications and settings from the same. You can bring the focus to the Desktop using Win + D which will minimize all the apps in focus currently. You can then use arrow keys to navigate around the apps and can select multiple items using Ctrl + Arrow keys to move around the items and pressing spacebar to select the desired items. You can also directly open the properties of any file using Alt + Enter after selecting the desired file. You can view your recent activity using Win + Tab for the last 3 days or up to last 30 days if you let Microsoft store your activity history but I won’t recommend you to do so. You can switch between applications and even open applications which were closed by you in the last 3 days using the recent activity. Windows lets you snap multiple applications on a single screen by splitting the screen into halves. In Windows 10, you get a Snap Assist Feature which automatically suggests you snap other applications as soon as you snap one application on the screen. This can be done simply by using Win + Arrow keys to snap the app to either side of the screen. Tabs: You can open a new tab using Ctrl + T and close it using Ctrl + W. If you want to reopen the closed tab than you can reopen it using Ctrl + Shift + T.
Switch Tabs: You can switch to a particular tab using Ctrl + number where a number (1–8) is the position of the tab from the left, so Ctrl + 1 is the first tab and Ctrl + 9 is the last tab. If there are more than 8 tabs than you won’t be able to switch to the desired tab directly after the 8th position. You are free to navigate between the tabs using Ctrl + Tab to switch to the next tab and Ctrl + Shift + Tab to switch to the previous tab. Duplicate Tab: There’s no quick shortcut for duplicating a tab on Web Browsers instead of just Right clicking on the tab and selecting the ‘Duplicate Tab’ option. But there’s a trick for duplicating a tab using the keyboard and that is by first highlighting the URL using Alt + D or Ctrl + L and then using the Alt + Enter to duplicate the Tab. You can go back using Alt + Left Arrow and go forward using Alt + Right Arrow. You can open a new window using Ctrl + N and a new private window using Ctrl + Shift + N.
You can complete the URL using Ctrl + Enter which adds a com to the end of the entered URL so it won’t work for domains other than the .com Top-Level Domain. You can view your Downloads using Ctrl + J, History using Ctrl + H and Bookmarks using Ctrl + Shift + O. You can Bookmark any webpage using Ctrl + D.
You can open your Homepage using Alt + Home. You can select the next element using Tab and the previous element using Shift + Tab. You can view inspect element using Ctrl + Shift + I and page source using Ctrl + U. You can make the text bold using Ctrl + B, italic using Ctrl + I and underline using Ctrl + U. You can increase the text size using Ctrl + Shift + > and decrease it using Ctrl + Shift + <. You can select multiple characters using Shift + Right Arrow keys. You can select an entire line of text with the cursor at the beginning using Shift + End or Shift + Home if the cursor is at the end. You can change between the languages installed on your machine using Win + Spacebar. Ueli: A keystroke launcher for quicker access to your apps, files, and folders in Windows. ShareX: It lets you capture or record any area of your screen and share it with a single press of a key. It also allows uploading images, text or other types of files to over 80 supported destinations you can choose from. Ready to use your Keyboard Shortcut Superpowers? Now you know the quickest way to achieve all these tasks by using keyboard shortcuts which would definitely save you some time and make your life simpler. So next time when you browse the web or edit a document, you will have shortcuts for everything and all you need is practice to get used to it. Thank you so much for taking the time to read this! If you enjoyed it, please give it a bunch of claps as it’ll help more people see this story. ?